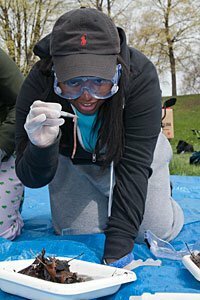 Students from dozens of Detroit-area elementary, middle, and high schools study the ecology of the Rouge River every year through the Rouge Education Project. They sample river water, looking for living creatures and making various tests of water quality. The Rouge River flows through many suburban Detroit communities before emptying into the Detroit River.